James T. Godbolt, a.k.a. Dr. Jimmy Slyde (b. 1927- 2008), was one of the few remaining members of a vanishing generation of America's master jazz tap artists and teachers. This is a tradition that is best passed along from dancer to dancer, master to apprentice, feet to feet. 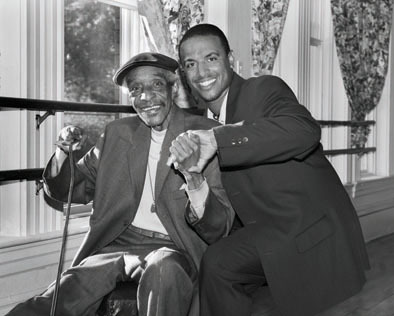 Raised in Boston, Jimmy began studying in the 1940s with Stanley Brown and Eddie "School Boy" Ford. Jimmy has performed on stage, at clubs, and in dance festivals throughout the United States and Europe. In 1999, the National Endowment for the Arts awarded him a National Heritage Fellowship. In May, 2008, just days before this exhibition opened, Dr. Jimmy Slyde died after a long illness. He was 80 years old. Edward Mendes III, a.k.a Rocky Mendes (b. 1980), has been studying tap dance since he was nine years old. He was 16 and studying dance at the Whitman Academy of Performing Arts when his mother took him to meet their neighbor, Jimmy Slyde. The older man took the younger under his wing and the two became friends. The pair were awarded an MCC Traditional Arts Apprenticeship in 2001 and again 2007. Jimmy called himself a "nudger," instead of a teacher. He stressed going back to the basics - time step, shuffle, riff, brush, slap. These are the moves a dancer must master, like mastering the elements of speech in order to have a conversation. Jimmy reflected on his extensive work with Rocky, "He's a joyful young man and I think he's worth every minute of it." Mendes has gone on to perform with Diane Walker, Savion Glover, and Gregory Hines, appearing at Williams College, Florida State University, New England Conservatory and Jacob's Pillow. Rocky curretnly teaches at the Boston Arts Academy and the White Academy of Performing Arts.Jimmy Slyde passed away on May 16, 2008.